Home »Stories »Family Stories »No, Santa Doesn’t Have a Heat Stroke – It’s Christmas in July! No, Santa Doesn’t Have a Heat Stroke – It’s Christmas in July! 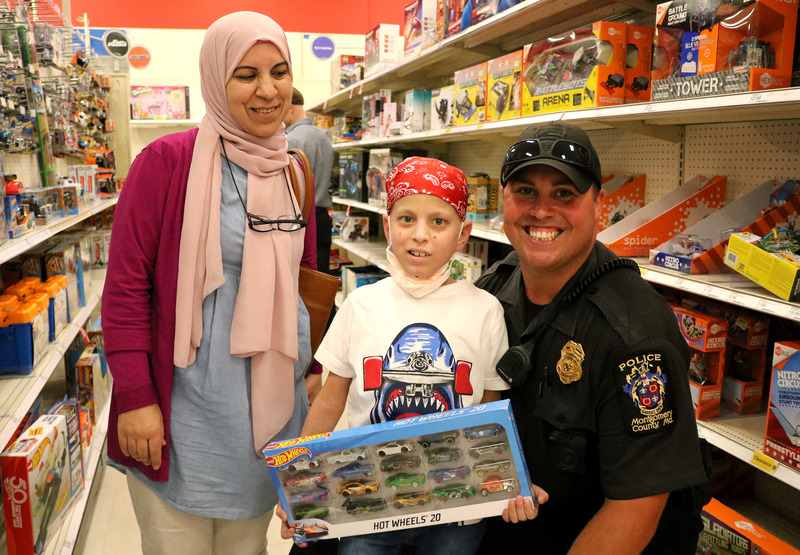 Children staying at The Inn received a very special surprise last week: a summertime shopping spree with Santa Claus and a dozen motorcycle officer elves from the Montgomery County Police Department and the National Institutes of Health (NIH). After greetings and photos with St. Nick, 33 children and their families boarded two buses decorated on the inside with red and silver snowflakes destined for Target in nearby Gaithersburg. Santa and his motor elves then escorted the buses with sirens blaring through Bethesda rush hour traffic. 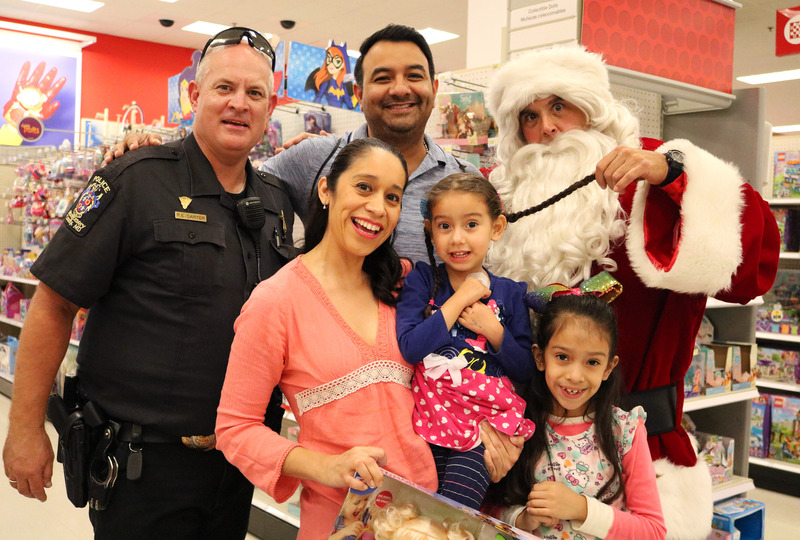 At the store, children paired up with police officers to get help shopping for toys using donated $50 gift cards. Children and cops dashed through the aisles to find the perfect dolls, clothes, collectible cars, board games, costumes and more. Among them was Luna Beltran Plata, 4, who is receiving treatment at the NIH, her sister, Dania, 7, and their parents who enjoyed the chance to celebrate a special summertime Christmas during their extended stay at The Inn. “It was awesome,” Luna’s mom, Yury Plata Martinez of Mexico, said of the special shopping event when interviewed by FOX 5’s Gary McGrady. “We feel like super stars, like rock stars.” Watch the video on FOX 5. An hour into shopping, Santa and his motorcycle officers escorted the children to a local pizza buffet for dinner. See more fun photos from the event here.